From Bled we moved on to Lake Bohinj which is an area forming part of the Triglev National Park - the only national park in Slovenia.There isn’t a town or village called Bohinj but the area is named after Lake Bohinj which dominates. It was only about 20km away so we were well installed next to Lake Bohinj by lunchtime which gave us a chance to take a 4km walk after lunch – mainly uphill and followed by 510 knackering steps – to the Slavica falls. These are long and noisy (we can hear them from our van at night) and provided refreshing dampness on a sweltering day. It was possible to continue walking in the national park and there were a series of overnighting huts available for such fit folk. There were a lot of beautifully maintained churches in Slovenia,apparently the Roman Catholic church is quite powerful in that country. 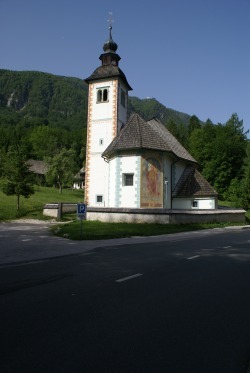 This church was near Lake Bohinj, note the big painting on the outside wall. 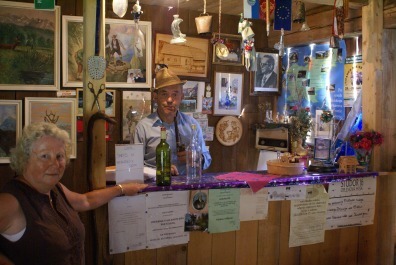 Sheila and the museum custodian enjoying a shnapps in the bar. Gregor has put on a traditional straw hat and holds a traditional Slovenian pipe for the photo. 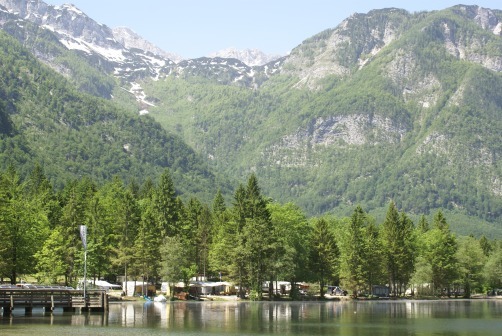 What you see in this picture is our camp site at Lake Bohinj (Camping Zlatarog) and our pitch was lake frontage. It's a simple site but it had hot water showers and toilets with toilet paper which is all you need. In summer ( which started the day we left) there is a bar too. From Slovenia we moved on to Lake Garda, see Italy page. Rather a long trip but we found that we were running out of time on this trip and Sheila had visited Lake Garda forty years ago and felt it time for a return trip. A couple of shots of the lake.